Corals are so sensitive to climatic change that scientists study coral reef fossils to construct highly detailed chronologies of prehistoric climate patterns. 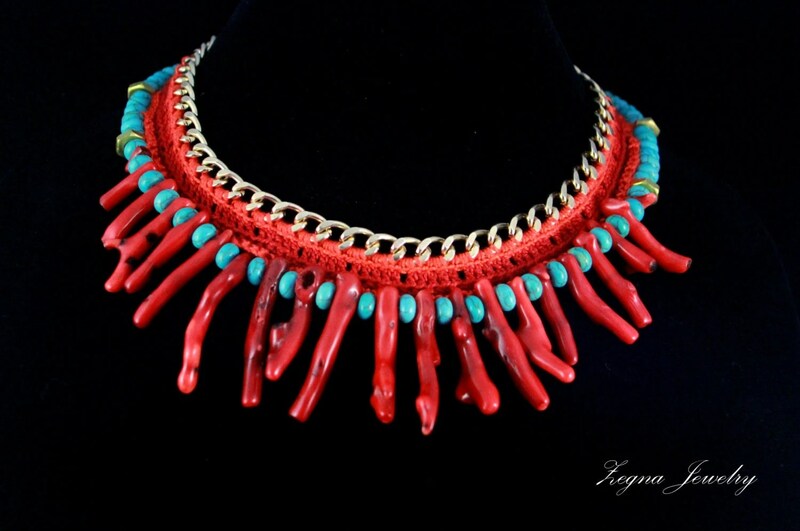 Beautiful and bright crochet necklace will attract lots of attention to your outfit! 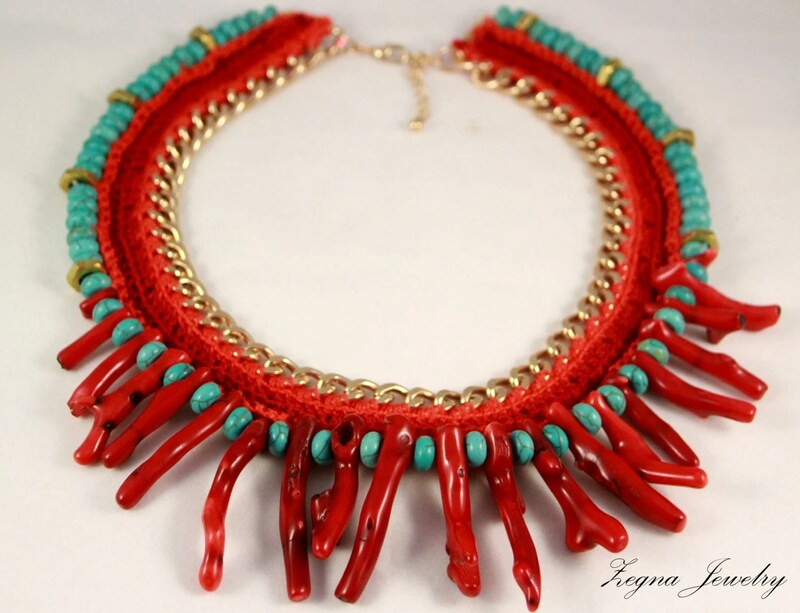 Crocheted of 100% Egyptian cotton thread and featured with dyed bamboo coral sticks and Turquoise dyed howlite beads. Materials: Gold tone chunky chain, 100% Egyptian cotton thread, gold tone copper wire, dyed bamboo coral sticks, Turquoise dyed howlite beads. 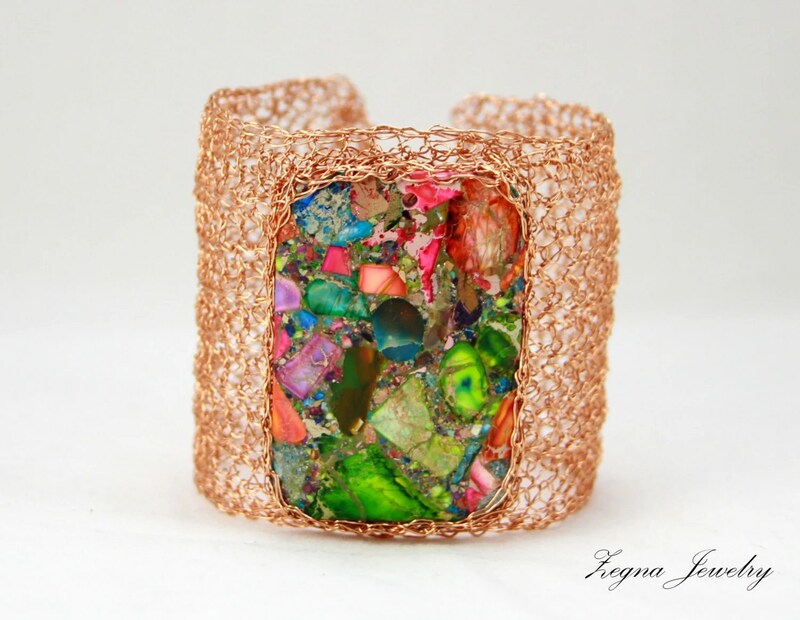 Beautiful Handmade crocheted wire bracelet cuff features Candy Orange Onyx window druzy cabochon. One of a kind! – Closure: 5-strand slide silver pleated clasp. 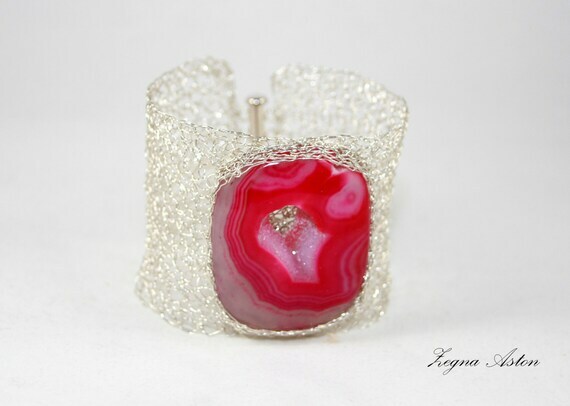 – Material: Silver filled wire,98.85CT Candy Orange Onyx window druzy cabochon. Onyx is thought to increase regeneration, happiness, intuition and one’s instincts. It is also told to decrease sexual desire, and to aid in changing bad habits. 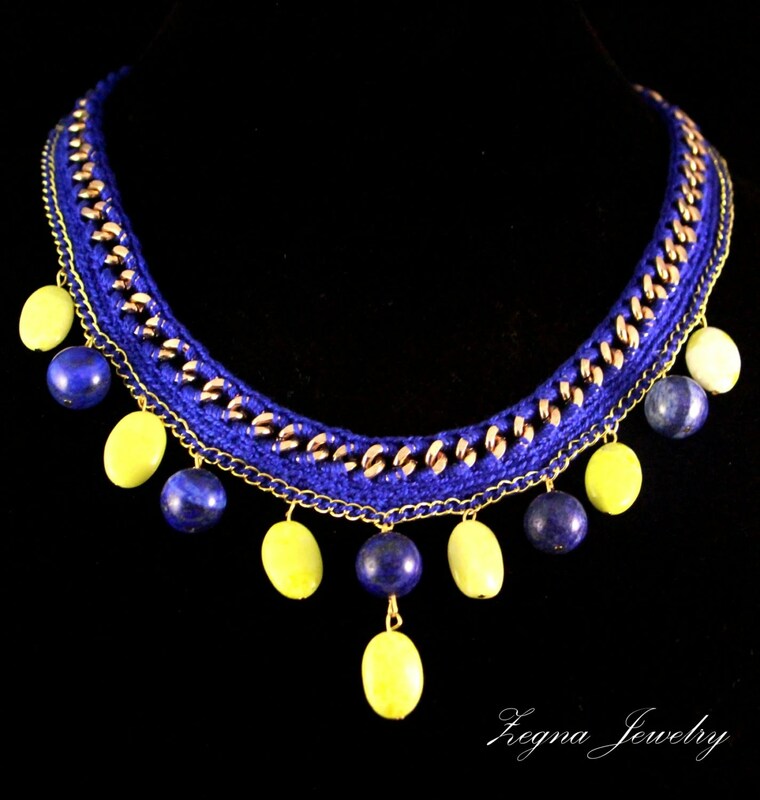 Fun and stylish necklace is perfect for summer. 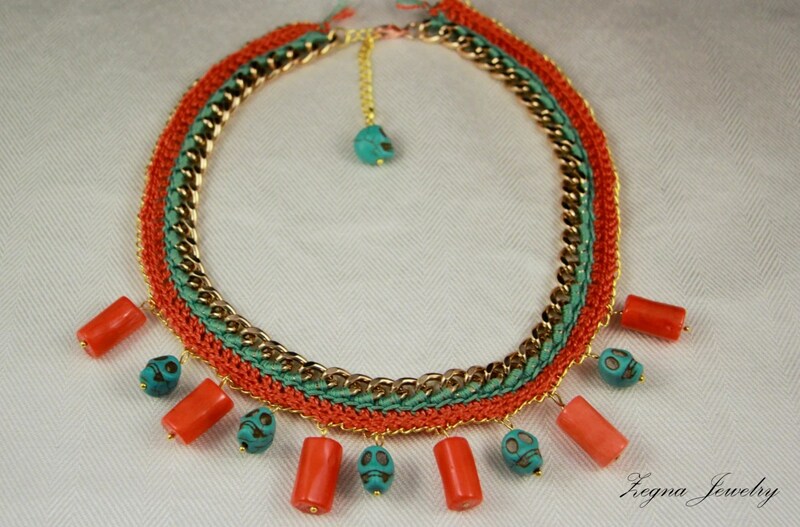 Materials: Gold tone chain, Cotton yarn, turquoise dyed howlite scull beads, bamboo corls beads. Love them all but I think #1 is my fav! Today is The Day when I will choose The Winner Of My Custom Crochet Necklace Giveaway! Last 2 days to enter my Custom crochet necklace Free Worldwide GIVEAWAY on my Facebook. Simply like my page opent the FB link http://a.pgtb.me/1FrGJN and leave a comment what necklace you want to win! That’s all! On July 25 I will randomly choose the winner!! Like post with Giveaway on FB and leave a comment what necklace you want to win and why.